For the first time in this branch, Venjakob has combined an antromophical robot with a linear spray coating machine. 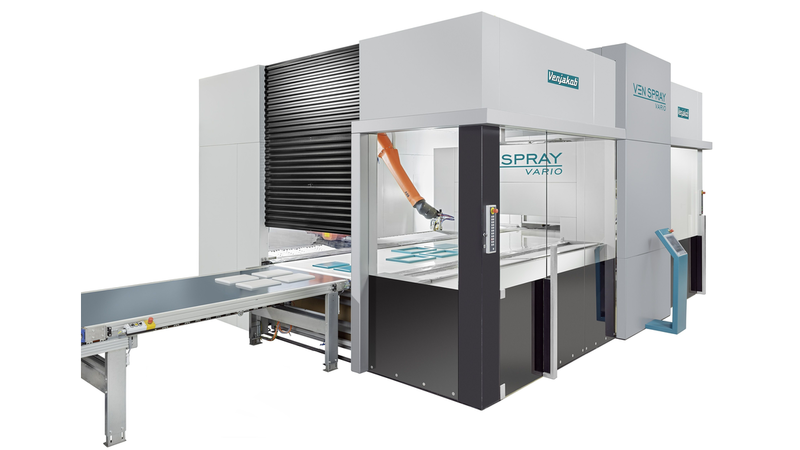 The VEN SPRAY VARIO combines the flexibility of an industrial painting robot with the high output of a reciprocating spraying machine. Precise coating of edges by robot and coating of surfaces by reciprocator with constant speed »inline«; no stopping, no stop and go, just constant work flow. Therefore more output (coated surface/minute) in comparison to other machines, available on the market. One advantage of this system technology is also the better cross linking of the paint film at the transition from the surface to the edges. Complex 3-D parts can be coated while stationary. In this case the usage of the optional paper belt transport system is recommended. For further flexibility, the plant can also be operated only in surface modus. Venjakob has also focused on energy and resources efficiency while developing new plant technologies. An example is - among others - a well-engineered and effective paint-recovery system. In addition, efficient fan technology reduces the energy consumption. The modular design pays back to the customer and his permanently changing requirements. As the need arises, the plant concept can be expanded variably e.g. one robot with linear axis or two robots followed by a linear axis for a higher output. Constant parameters, equal exhaust and drying times of the work pieces guarantee reproducible results and best finishing quality.